All posts by Brenda Friend of Jesus! 10-11This is God’s Word on the subject: “As soon as Babylon’s seventy years are up and not a day before, I’ll show up and take care of you as I promised and bring you back home. I know what I’m doing. I have it all planned out—plans to take care of you, not abandon you, plans to give you the future you hope for. Recently there have been several difficult changes in my life. My boss passed away and we received a new owner where I work. I feel as though I have lost an entire family just to gain a new set of strangers in my life. I am still struggling with the separation from my husband of 19 years. My kids are growing up so fast and with my son moved out and my daughter a camp these past two weeks, I have a taste of empty nest syndrome, and I dislike it. As my job seems not to fit me so much any more, I am beginning to seek God out more and more, finding answers which just honestly scare me a bit. I feel my destination in this life is more than being a restaurant manager. I have a call on my life to be a writer, speaker and a teen leader. Is it time for me to step into what God has called me to do? Am I ready to take the leap of faith that I need to? My friend has given me some material to read, which prompted me to start this blog, begin a website and finish writing my book. One of the books I read said the average job is 2 to 5 years, I have been at my current job for 25 years and it seems as though I have settled for where I am instead of living and doing my dream job. A few months ago I attended a revival that lasted 52 days. I know it is a touchy subject for some, but God showed up in such a real way to me at this revival that I hunger for more of it. Tonight as I struggled to sort some things out in my recent events, a close friend of mine reminded me of the night we prayed to have the Holy Spirit “wreck” our lives during the revival. To give Him permission to change us in a way that we would be forever changed. Is this what is happening to me now? I get so excited about the prospect of writing full time and speaking to others about the ordeals of my testimony and offering the peace of God to many along the way. Our Father in heaven, our Creator, knows the plans He has for our lives. Even though we may not understand through the struggles just exactly what is on the other side, we have to believe that He knows best. We have to trust Him to open the right doors and to light our path. We need to let Him use situations and people to teach us right from wrong. We need to seek Him out around every corner and trust in the revelation. We have to proclaim, “Daddy knows best!” even when everything around seems not to make any sense. Are you going through unexplainable things right now? Children not following what you think is the right path? Stuck in a rut financially? Going to a dead-end job you dislike day after day? Going through a divorce? Whatever it is, step back for a minute and find God in it, earmark the place you are and ask God where you are going. Ask Him to direct your life and begin to fashion yourself into the image God sees you as. Yes it may take a giant leap and a tremendous amount of faith, but won’t it be worth it when you are doing the work you were designed to do and changing lives? [ An Asaph Psalm ] The God of gods—it’s God!—speaks out, shouts, “Earth!” welcomes the sun in the east, farewells the disappearing sun in the west. From the dazzle of Zion, God blazes into view. Our God makes his entrance, he’s not shy in his coming. Starbursts of fireworks precede him. Who lights the fuse to your reactions? Are you quick to blow up and send sparks flying at the slightest disruption to your day? Or are you a more contained, reserved person that waits until everything builds up and then BANG! out of no where you just explode? Perhaps you have no fuse, you are disconnected and become a “dud”. Or are your fireworks internal where God has control? As we reflect on who is your fuse lighter we have some choices. One would of course be the world. Aggravation leads to anger and anger becomes explosive words of neglect and hurt. When we use the world to light our fuse, we are often hot-headed and no one wants to even get close to us. They feel threatened by the massive about of explosives you carry with you, they never know what might set you off. Self-fused fireworks are very temperamental. Never predictable. Often easy to light one day and then a dud the next. No clear direction. No colorful display, sometimes just smoke fumes from them. These are those who struggle between the world and choosing God to rule thier lives. Then we have the God-fuse. This type of firework is seen a quiet way. It’s color radiates from somewhere within. There is no alarming BANG or excessive smoke, just beauty. When we allow God to light our fuse, we are a blessing to others. Some come to us to gaze at what God has done in our lives. Many desire to have what we have because there is a peace which surrounds us. Take a moment. What kind of firework fuse do you want to have? One affected quickly by the actions of the world? One activated by emotions? Or one ignited by the One who created the fire within us? Just a short note today about how worship can just clear your mind and bring your focus back on track. Frustration just crept into me today and I was letting it ooze into my relationships, my mood, my attitude and most of all into this ugly thing called self-pity. I sometimes get so angry at where I am in life I begin to lose focus on all the good things I have going for me. After a slightly heated discussion with my daughter, I melted into this ball of self destruction and even though my spirit knew it was just a flesh thing, I could not stop it. So in anger I left the house. Not mad at anything specific but my emotional basket had some how overflowed. Missing my husband a little, missing my boy, knowing my daughter was leaving again tomorrow for camp after only being home two days and the stress of new management at work. I had not realized how heavy things were getting in the flesh. So in the car I crank the radio and it’s this really take charge of your life kinda Christian song and it takes me away. I go to the local grocery store and am able to minister to someone quickly as I am picking up cat food. 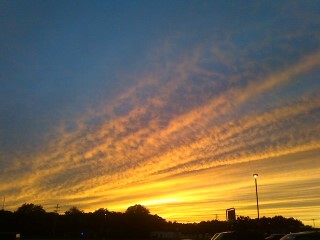 I make my purchases and step out of the store to witness this breathtakingly painted sky. Followed by seeing some of my favorite persons, TEENAGERS, at the gas station. See what happened? I turned on the worship and it almost instantly changed my mood. I refocused my mind on the things of God and He showed me He was listening! In a very short period of time He reminded me of the things in my life which I love and He as orchestrated for me. God is good and worship brings out the best in Him! I encourage you the next time the flesh is nagging, turn on some LOUD Christian music, praise God like you never have before and watch what He will give to you in return! Hydration, the supply and retention of adequate water, is as simple as drinking a glass of water to quench your thirst and keep you running around this planet. It is necessary for survival, yet so many of us neglect to keep enough of it in our systems. When this happens we become dehydrated, defined as the excessive loss, and we become weak and unable to function, sometimes causing us to be hospitalized or die. So be it with our Christianity. What happens to our inner man when we do not give it the Word on a daily basis? How many of us starve from lack of knowledge about God? When we begin to ignore the things of God we can become spiritually dehydrated and begin to fade away from His will. Some of us walk away weakened and only return years later thirsting for the things of God in a way we never had before. Some never become re-hydrated, missing out on what God had in store for them. “Yes, and I’m the One who stopped the rains three months short of harvest. I’d make it rain on one village but not on another. I’d make it rain on one field but not on another—and that one would dry up. People would stagger from village to village crazed for water and never quenching their thirst. But you never got thirsty for me. You ignored me.” God’s Decree. We need to hydrate ourselves in the Word. We must obtain and pour the Living Water into our souls as much as possible. God calls us to drink. 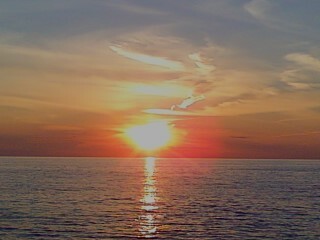 He beckons us to come by the still waters and fill our souls with His goodness. I encourage each of us to take a drink from the Word every chance we get. To be thirsty for the things He has provided for us. To wake up so hungry for the things of God that we cannot start our day until we have taken a sip from His provision. “Come!” say the Spirit and the Bride. Whoever hears, echo, “Come!” Is anyone thirsty? Come! All who will, come and drink, Drink freely of the Water of Life! ourselves in panic mode and we temporarily go blind. We can’t see God anymore because we have let our emotions overtake the situation instead of looking for God. We run about frantically trying to fix everything ourselves because usually we have put ourselves in dangerous situations and we want to fix things before God notices. Okay, lesson one: God is all knowing. All seeing. All hearing. How can we possibly do anything under His watchful eye without being noticed? Yes we make mistakes, do you think He does not know this? It’s like a pastor said a few Sundays ago, we live in a Humpty Dumpty society and we just want to fix things all the time. Well in my opinion, who put and egg on a wall to begin with? Why do we put things we treasure in harms way? If we were looking for God in the first place, would we not have found ourselves in such needless predicaments? Just recently a young man drowned in a river near my home. My daughter had texted me the minute she heard about it and I began to pray. I was sitting with my son in a restaurant having lunch at the time, and as I looked up from praying I glanced out the window. In doing so I noticed a mirror and in the it was a reflection of the frames from the window. I was quiet in awe for a moment as I realized there was a cross in the mirror and it gave me a peace knowing God was in this tragedy that was unfolding in our lives. There have been so many times in my life where I wished I had sought after God before making major choices. I know I cannot go back and change anything but I sure know I learned from these experiences. If anything it makes me want to look for the crosses in my life first, not after or during a crisis, instead seeking His will for my life from the beginning. As humans we get these great ideas and we think we can out do God or function on our own without His direction. What if we stopped to pause a moment before we set our “egg” on a wall, where we know in the back of minds we are setting it up to fall, and just looked for the cross? I challenge us all to seek out the crosses. I often find them in most unusual places like in a restaurant for instance or when I am taking a hike I will find sticks in the shape of crosses. 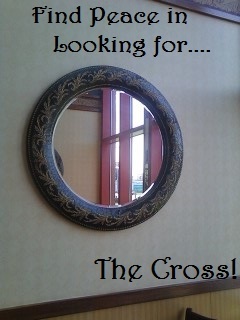 I encourage you to share those photos in the testimony place here and share how you feel about finding that particular cross in your life. The cross is the only place you can lay it all down and be a peace with walking away. Well, here it is, my first official BLOG! I look forward to sharing my walk with Jesus with you here in this multi-media world and I hope to give you encouragement and inspiration along the way. Life is a journey of events. What we glean from our experiences is how we can influence others. By choosing to see God in all things, life becomes a little easier to bear. Yes we have things taken away from us only to discover God had something better in mind all along. I pray I will be able to be honest in my sharing and in the next few postings I will get us all up to speed to where I am with God at the moment and how I feel about the things God is doing in my life. We all need a direction to follow, mine just happens to be the way of the road paved in gold. The path to heaven is right in front of you. Go ahead, step upon it and let God be your tour Guide!